One believes in Hustle, Loyalty and Respect. The other? Leaving HLR in Blood, Vomit, and Urine. We’re only a few days away from Summer Slam. The card is stacked with potential for good matches and a lot of action. (Insert link to preview) If you read my preview of Summer Slam then you know I’m looking forward to watching it on the WWE Network for $9.99. Now that the cheap plugs are out the way let’s get to predicting the card. Jon: WWE has given the tag division a little time to shine as of late, but it’s far from being an emphasis and that’s a shame. Goldust and Stardust ae very entertaining to watch, The Wyatt Family will bring the brutality. Rybaxel is in this match to look at the lights for the 1, 2, 3 as the high flying twins Jimmy and Jey Uso retain their titles. Nathan: This is a great way to get multiple guys on the show that is often referred to by the WWE as “The Biggest Party Of The Summer”. I’m actually growing tired of Stardust, as it’s gotten to a point where I just don’t care. I was hoping it would be a short term thing to further Cody turning heel but that is not the case here. The Uso’s have been the champions long enough and I feel it’s time for the title’s to change hands. I expect The Wyatt Family to pick up the win and the titles here. Nathan: I’m not a fan of the Miz in the slightest, he’s not a good wrestler and his character got stale a long time ago. Even this new Hollywood Heel Miz gimmick does nothing for me. However having said that I see no point in having Miz lose here because as far as I am concerned Ziggler by now should be well above the Intercontinental Championship. Jon: Only way to go in this battle of Super powers and that’s ‘Murica. This face turn for Jack Swagger is really working. Now if you all can rise and repeat after me WE THE PEOPLE. Nathan: I have really enjoyed this feud and it has rejuvenated Jack Swagger. A year ago at this time I could care less about the guy but now that they have figured out what exactly they wanted to do with him I am 100 percent behind the positive change he has made. He has always been a guy I’ve felt had it and now he’s definitely showing his talent in the ring. This match could go either way but I feel Rusev will take this and then move on to someone else. Jon: After the recent attacks by Paige you can expect AJ’s crazy meter will be off the charts. We all know what happens when AJ gets in that crazy state and Paige won’t be able to beat her this Sunday. Nathan: I’m glad to see what they are doing with this feud, it was getting a bit stale and they did a great job of freshening things up with a double turn on a recent edition of Monday Night RAW. Having said that I really don’t see the point of having Paige retain the title but WWE has done crazier things so even though I believe AJ will retain the title here I wouldn’t be at all surprised if Paige becomes the new diva’s champion once again. No United States title match Sunday, that means no Sheamus so we all win. Nathan: I almost forgot about this match, I’ve honestly thought that while this storyline with Jericho should have worked wonders for Bray Wyatt and the Wyatt Character it hasn’t really done anything. The only redeeming quality of this match is that both Luke Harper and Erick Rowan are banned from ringside during this match meaning that Bray Wyatt will be by himself in this match. This is exactly how this match needs to go, Wyatt has yet to get his signature win and I hope and pray that it will come this Sunday. Bray Wyatt is in a MUST win situation here if he doesn’t win I will no longer care about the character (my interest is already dwindling) the whole “I don’t need to win a match to prove my point” theory that the WWE seems to be going with doesn’t work that well with me and if Wyatt fails to beat Jericho and win in a big way then the character as a whole might be considered a failure which is a real shame because it was great at the start. Jon: If you read spoilers than you probably will assume that Nikki Bella will turn on her sister and side with Stephanie McMahon. This has been a Bitchfest from the moment Brie slapped the billion dollar princess in the mouth. I anticipate Brie winning this match, though that might be wishful thinking. Nathan: A few weeks ago I could care less about this match, I have heard that we were going to get this match at some point and I wasn’t at all interested in seeing it. Then it was announced and I still wasn’t interested. Then the terrible thing on RAW from this past Monday happened and I am just not at all invested into this match. For prediction sake I’ll say that Stephanie picks up the win here but I honestly could care less about it but hey it’s a bathroom break match anyway so there’s that. Jon : Match of the night right here, place your bets and go straight home to the back with the winnings. This is by far the best storyline the WWE has running for my money. No doubt that both superstars will deliver a spectacular performance. With the ring surround by superstars it’s required that they get involved in some form or fashion. Dean Ambrose will win the match, how ill MR. Money in the bank and the Authority respond when he doesn’t get the job done. Nathan: This is one of the reasons why I want to see this show, and I feel this match has the potential to steal the show. Like Jon said this is the best storyline that the WWE currently has going and I find myself looking forward to where it will go next. We will know the answer to that question on Sunday but whichever way it goes, it should be one hell of a match. I’m also going for Dean Ambrose to win this match and awaiting how the Authority will react to a Rollins loss. If you’re keeping score right now its The Authority is down 0-2 in matches they are involved in so far at Summer Slam. That will change with the next match. Jon: Say whatever negative things you want about these two athletes, this contest will well worth the 9.99 subscription to the network (plugging the network just like Michael Cole). With Randy returning to his Viper ways things between him and Reigns have elevated to new levels. Reigns brings the power packed superman punch along with his version of the spear, it won’t be enough to keep Orton from hitting him with a RKO and picking up the win. A win over Reigns will put Orton back in the Hunt for the WWE World Heavyweight Title. Nathan: Okay let me get this out of the way, I didn’t expect this match to happen at all because it was originally supposed to be Triple H vs. Roman Reigns from what I’ve heard. I’m actually not feeling this match at all, I’m sure it will be passable but Randy Orton is extremely stale and Roman Reigns has failed to impress me since breaking away from the trio that was The Shield. Roman has been less than passable on the microphone and he doesn’t really cut it in matches. His flaws have really shown through since the Shield broke up and while he should be improving I’m just not seeing it. Plus he’s approaching the dreaded five moves of doom category that many top WWE stars tend to fall into which gets extremely boring. But hey we are guaranteed at least ten moves in this match right? Anyways I’m going for Reigns to win but if Orton were to win I would be fine with it because this match is just there to me. Jon: As a member of the Cenation you get used to Cena beating the odds, kicking out at every 2 count, and turning into SUPER CENA to pick up the victory. This time nothing he can do will put him over the BEAST Brock Lesnar. Lesnar and Cena matches are never pretty but they’re always viscous. 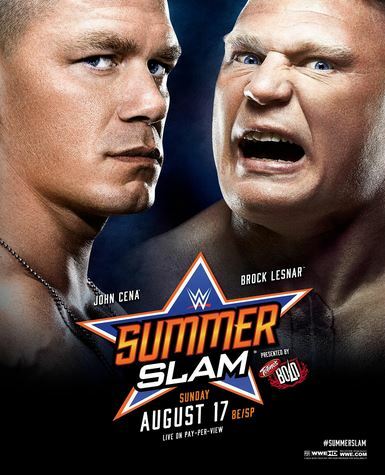 Im not sure how many F-5 Cena can get up from or how long will it take for Brock to break one of his limbs if not all. Brock is winning the championship and that will make Paul Heyman the biggest heel in the company. How? Heyman will talk about this victory, this Summer Slam victory FOREVER. Nathan: I’ll say this and get it out of the way right now, Brock Lesnar HAS to win this match there is no way around it. Brock Lesnar did the one thing everybody thought was never going to happen, he broke the Streak of the Undertaker at Wrestlemania. He hasn’t had a match since he claimed that illustrious distinction and he need to win his first match since breaking the streak. If John Cena wins then Brock broke the streak for nothing because what is the end game? The end game to the streak being broken would be that Brock would eventually be the WWE Champion again and that is exactly what is going to happen. This is the only time in John Cena’s career that I can legitimately bet against him and I am about 95% sure that I will be right. However it is Cena and stranger things have happened. If Cena does win this Sunday I’ll probably just laugh and be done with it but like I said earlier Brock Lesnar needs to win this match and that is that. There you have it your predictions for Summerslam 2014, will John and my predictions pan out the way we think they will, or will we be totally wrong? Either way we will be excited to watch Summerslam live this Sunday on the WWE Network because underwhelming build or not, WWE Summerslam usually delivers and I have a feeling that this years Summerslam will be pretty good in the end. After all, it has all of the potential to be a really good show, but will it be better than last years show? Probably not, but it will still be pretty good in it’s own right. Lastly be sure to follow Jon on twitter @BigJonDaLegend and myself as well @Headliner5 and also be sure to visit eyesonthering.blogspot.com and be sure to give them a follow on twitter as well @eyesonthering.